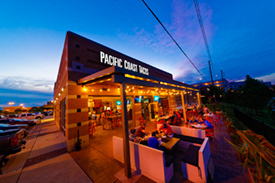 Lincoln and Lyndsay introduce an inventive and ambitious concept the culinary world hasn’t seen in Pacific Coast Tacos. This concept is truly cutting edge and forward thinking in menu and design. 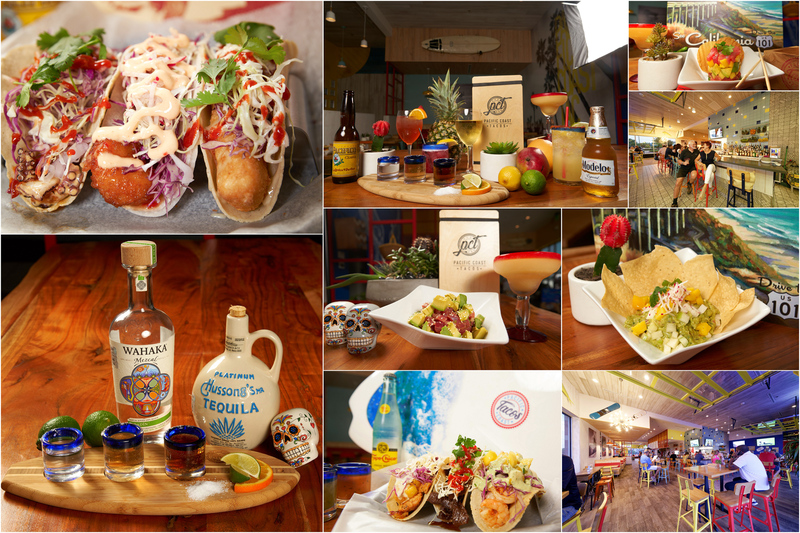 Pacific Rim influences such as Poke Bowls, Won Ton Lobster Tacos, and Tom Kha Soup compliment a collection of the most flavorful and unique tacos anywhere. Fresh Pacific Ceviche’ and PCTs signature Guac topped with fresh mango, jicama, green apple and radish exemplify the creativeness of PCTs culinary identity. “Taco ’bout Tacos?” Enjoy the Korean Beef Taco. CAB beef sliced fresh and soaked in scratch bulgogi marinade, seared to perfection and topped with shredded napa cabbage, cilantro, sliced radish, scallion, citrus soy, and chili sauce served in a fresh sliced jicama tortilla. Other popular selections are the Pacific Octopus Taco, the Hawaiian Kalua Pork Taco, and the Thai Chili Chicken Taco which calls for a unique scratch Thai marinade created by Lyndsay. Lyndsay combines exotic Thai herbs and spices producing an amazing depth of flavor. This taco is topped with sprouts, julienned carrots, cilantro, peanut sauce, chili sauce, fried jalapenos, and served on a fresh sliced jicama tortilla. This scratch kitchen is open for breakfast, lunch and dinner. But you’ll find no walk-in cooler or freezer at Pacific Coast Tacos…the freshest herbs, spices, fruits, vegetables, and proteins available are delivered daily. GM Robby Bulian, who has also contributed to the Pacific inspired menu, says, “Our team arrives as early as 5am to make the corn and flour tortillas by hand for the day.” PCT’s signature jicama tortillas are sliced fresh from the root vegetable, and the wide selection of salsas at the salsa bar are also made from scratch daily. Equally on par with the fantastic food is the full bar at Pacific Coast Tacos. We’re talking atmosphere and selection. Falling in line with the quality of the food served is an excellent selection of cocktails, margaritas, beer, and wine. Natural agaves are infused with fresh fruits, vegetables, and peppers right in the kitchen. This bar is also all about mezcals and tequila. Lincoln and Robby agree, “We are super excited to introduce unique tequila and mezcal flights to the Fort Bend community! Tequila and mezcal have so much to offer with unique brands and distilling processes. They are truly amazing spirits enjoying a height in popularity and renaissance.” Enlighten your palate with refreshing cocktails such as the PCT Watermelon Cocktail and the Zesty Strawberry cocktail, both inspired by renowned bar/cocktail specialist Justin Nobriago at Malibu Farms in Malibu, California. Red and Rosé Sangrias, along with a quality over quantity selection of margaritas, are also available. The Ward family and team have two new concepts on the “back burner” for Sugar Land to get excited about for 2019-2020. We can’t wait to hear what they’re taste testing now! Love love love PCT! The atmosphere is friendly and welcoming and the food and drinks are top notch! Can’t get enough!